Invisible, imperceptible and yet far more common than ordinary matter, dark matter makes up an astounding 85 percent of the universe's mass. Physicists are slowly but steadily tracking down the nature of this unidentified substance. The latest result from the PICO experiment places some of the best limits yet on the properties of certain types of dark matter. PICO searches for WIMPs (weakly interacting massive particles), a hypothesized type of dark matter particle that would interact only rarely, which makes them difficult to find. In this extreme cosmic game of "Where's Waldo?" the newest, most technologically complex detectors are usually considered the most promising. Many of these dark matter experiments rely on hundreds if not thousands of electrical channels and require racks of computer servers just to store the data they collect. But PICO relies on a simple phenomenon and a fairly low-key detector: bubbles, and a bubble chamber. At its core, PICO's apparatus is simply a glass jar filled with fluid in which bubbles can form and be monitored by a video camera. PICO had its beginnings in 2005 as a collaboration between the University of Chicago and the U.S. Department of Energy's Fermilab. (The experiment started under a different name, COUPP, and later merged with the PICASSO experiment to form PICO.) In the experiment's early days, much of Fermilab scientists' work was devoted simply to developing bubble chamber technology. Because while the bubble chamber was hardly new—it was invented in 1952—the technology had also been out of use for 20 years. Bubble chambers are designed to convert the energy deposited by a subatomic particle into a bubble that can be observed. In a liquid such as room temperature water, particle collisions do nothing noticeable. To achieve sensitivity to particles, the fluid inside bubble chambers is heated to just above its boiling point, so the slightest disruption could tip the fluid to a boiling state, creating a bubble. "You can actually watch the chamber and see the bubble form," said Fermilab physicist Hugh Lippincott, a collaborator on PICO. In typical particle physics experiments, information about particle interactions is given solely through computer interfaces. In PICO, the interactions are visible to the naked eye as bubbles. "It's great to press your face up against the glass and just … pop!" said Fermilab physicist Andrew Sonnenschein, also a collaborator on PICO. If WIMPs exist, they should occasionally interact with fluid in PICO's bubble chamber, creating a certain number of bubbles every year. It was a return to old-school, low-tech particle physics when Fermilab collaborators began engineering the PICO bubble chamber, which is installed 2 kilometers underground at the Canadian laboratory SNOLAB. 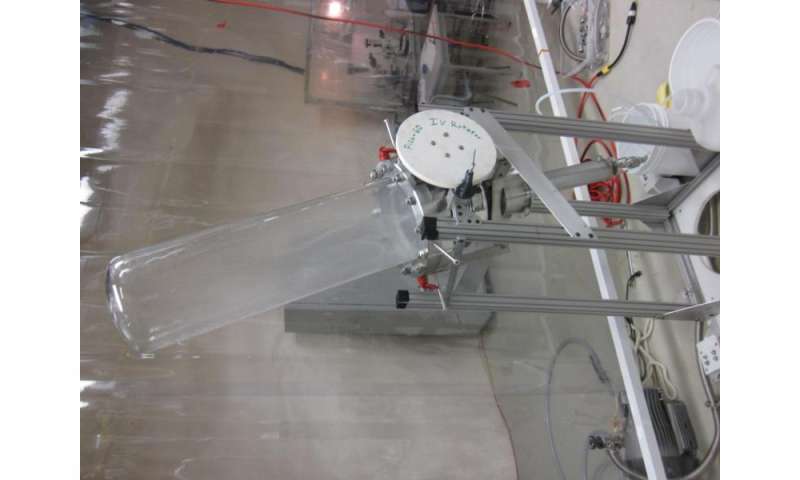 Bubble chambers of decades past had been used to track millions of charged particles such as protons and electrons, which would leave long, winding tracks in the fluid. "Old bubble chambers had a great run, but it ended in the '80s," Sonnenschein said. "They were too slow to keep up with experiments that had much larger data rates." As a result, bubble chambers were phased out when modern particle colliders such as Fermilab's Tevatron and CERN's Large Hadron Collider took over. Using complex electronics, detectors at these colliders were able to collect millions of times more data than bubble chambers. In fact, bubble chambers had been out of commission for so long that PICO's founders had to go back to the drawing board, return to some of the papers of the original bubble chamber pioneers, and effectively reinvent the technology for detecting dark matter. "After the early bubble chamber designers figured out how to make them work to track high-energy particles with trails of bubbles, the basic ingredients of the recipe didn't change. We're looking for low-energy particles that make only single bubbles, so many things are different," Sonnenschein said. The new design to allow bubble chambers to detect dark matter still preserves many of the elements from older bubble chamber detectors. "The thing that makes PICO interesting is that we're using a relatively simple detector design compared to the other dark matter experiments," said Dan Baxter, a Northwestern University graduate student and Fermilab fellow who was PICO's latest run coordinator. Unlike traditional charged-particle-detecting bubble chambers, PICO's bubble chamber is designed to look for elusive, neutrally charged WIMPs that might take years to make an appearance. "It's using it in a different way," Lippincott said. "In the old days, you would never expect to use a bubble chamber by just letting it sit there without anything happening." The weak force that governs WIMPs lives up to its name. For comparison, it's about 10,000 times weaker than the electromagnetic force. Particles that interact through the weak force, such as WIMPs and neutrinos, don't interact often, making them hard to capture. But even a slow-moving WIMP can deposit enough energy to be visible in a detector. 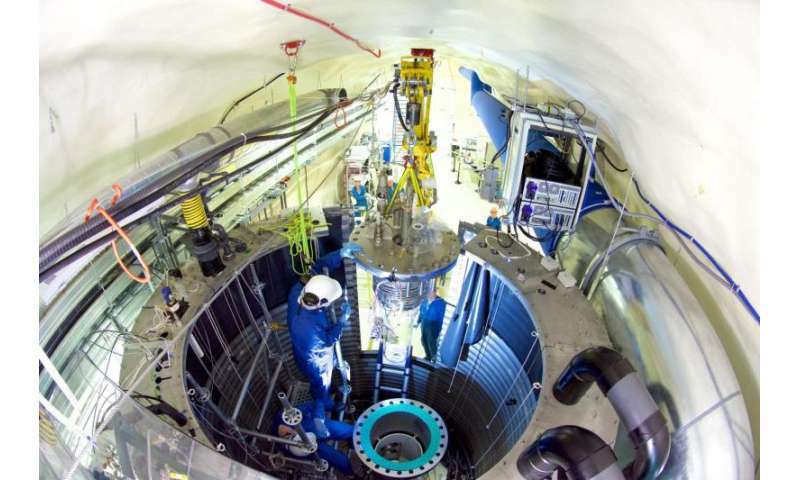 By carefully calibrating heat and pressure in PICO's bubble chamber fluid, scientists were able to make the detector sensitive only to the interactions from massive particles like WIMPs. PICO researchers were able to avoid much of the standard background, such as signals from electrons and gamma rays, that plague other dark matter detectors. Mastering the technology to do this took years. Predecessors to PICO started off as little more than test tubes filled with a few teaspoons of liquid. Gradually, the vessels grew larger. Then researchers added sound monitoring to their detectors to capture the "pops" from bubbles created by WIMPs. "We see a sound chirp," Sonnenschein said, referring to the bubbles popping. "It turns out that if you look at the frequency content of the sound chirp and the amplitude, you can tell the difference between different kinds of particle interactions." If a WIMP created a bubble, PICO would be able to not only see evidence of dark matter, but hear it as well. Using this acoustic technology, researchers were able to effectively veto bubbles that could not have been created by WIMPs, allowing them to eliminate background. As it turns out, PICO did not see any bubbles from WIMPs, so they were able to place limits on both WIMP masses and the likelihood that they will interact with matter—two factors that influence the number of bubbles WIMPs produce. Placing limits on these factors—mass and interaction rate—can tell physicists where they should look next for dark matter. "We don't know what dark matter is, and so there's a lot of theories about what it could be and about how it could interact with normal matter," Baxter said. The variety of theories calls for a variety of different experiments. Other experiments search for different sources of dark matter, such as particles called axions or sterile neutrinos. PICO's search for WIMPs has a specific focus on so-called spin-dependent WIMPs. "We don't know what the WIMPs are," Lippincott said. "But broadly speaking their interactions with normal matter would fall into two categories: one that isn't sensitive to the spin of the nucleus, and one that is." Spin, like charge, is an intrinsic quantity carried by particles and atomic nuclei. PICO looks primarily for WIMP interactions that are sensitive to the spin of the nucleus. To boost their resolution of these interactions, the researchers use a fluid with a liquid containing fluorine, which has a relatively large nuclear spin. With this method, PICO increased their ability to see spin-sensitive WIMPs by a factor of 17. Essentially, PICO's result is that these spin-sensitive WIMPs, if they exist, must interact extremely infrequently—otherwise PICO would have seen more bubbles. This result, which is by far the best yet for spin-sensitive WIMPs interacting with protons, does not rule out the existence of WIMPs. There are many other places left to still look for dark matter, but thanks to PICO, fewer places for it to hide. The PICO collaboration currently has a proposal in to the Canada Foundation for Innovation to build the next generation of PICO chamber, and physicists like Lippincott and Sonnenschein remain optimistic because of the technology's potential to scale up. "They're pretty cheap once the engineering is done, mainly because they're very simple mechanically. The fiddly bits are not very fiddly," Lippincott said. "There's a good chance that bubble chambers will continue to play a role in the hunt for dark matter." Can this experiment identify dark matter? That's the point: Make the experiment so we don't have to guess. People who think that an experiment that turns up nothing is a failure know nothing about how science works. Nothing.